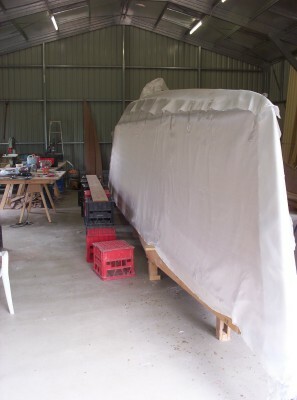 First pic shows the hull draped in glass cloth ready for the epoxy. It took 4 people about 3 hours to mix and apply the epoxy. Only real problem was that I'd used clear tape to hold the cloth in place, and we found a couple of pieces of tape underneath at cloth overlaps. At least we found them while the epoxy was wet. Next job is to fill and fair. It's a lot of hard work doing all the sanding. Things will slow down even more for a couple of months, as I'm booked in for a carpal tunnel operation next week. The symptoms have been hanging around for a few years. I think all the work with power tools, especially the orbital sander, has made it a bit worse.